I first started to read Toton Engineman – The Autobiography of a Railwayman, published by our sister magazine Steam World, when I picked up a set of proofs in the office, writes Norman Wright. I was captivated. Then they were whisked away to the printer. I couldn’t wait for the finished product to arrive, something I never thought I would say about a railway book. This is so much more than that. It’s a social history of British working life in the Fifties, Sixties and Seventies, cataloguing many of the huge changes we have all lived through. When John Woolley started work at the Toton marshaling yards near his home at Long Eaton between Nottingham and Derby in 1954, he had the burning ambition to be a driver. That meant starting at the bottom armed with an oily rag as an engine cleaner. John progressed to fireman on the footplate of those steam machines – a skilled job in itself – and achieved his ambition to drive trains on the Midland line but only after diesel power had taken over from steam. He finished his career as a manager with responsibility for area freight operations including the Toton yards. After retiring with 40 years’ service, John wrote this story of his working life. It’s full of the characters who worked in all areas of the railway business; they were often highly skilled, without much formal education, and were dedicated to the railway industry but fiercely independent. Sadly, John died in 1998 after enjoying only four years of retirement. His manuscript lay unpublished but it was an ambition of his wife Caryl and daughters Helen and Sarah to see it in print. An overheard conversation alerted Steam World consultant editor Nigel Harris to its existence and he joined the drive of the Woolley family to fulfill their dream. With more than 200 wonderful pictures, beautifully printed and produced in hardback, the book is priced at £19.95 (ISBN 978-0992739805). 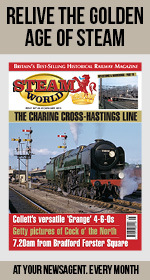 You can buy it direct for £21.90, including £1.95 towards postage and packing, from Steam World (Toton Offer), Steam World Publishing, First Floor, 2 King Street, Peterborough PE1 1LT by cheque, or to pay by card, tel: 01733 427513.